The dental laboratory industry is experiencing consolidation with the disruptive technology of 3D printing enabling the rapid prototyping and fabrication of the highly customized parts their business creates for customers. 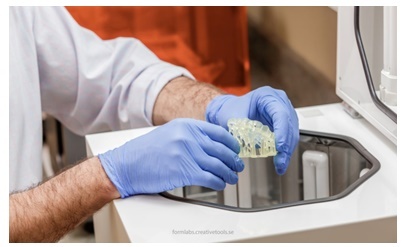 As the 3D printing of ceramics, metals, and other materials enters into wider use, dental labs will find themselves innovating and consolidating to streamline and increase the speed of operations while lowering costs. These sorts of innovation activities may qualify for federal and state R&D tax credits. 3D printing is an additive manufacturing process that leverages computer technologies and layer-by-layer fabrication to create customized, complex, and wasteless objects and parts. 3D printers are capable of printing parts in a variety of materials, including metals and ceramics. The ability to scan and completely customize the shape and features of the part reduces the design, build, and revision time of creating a part, which in turn creates costly savings. The features of 3D printing lend themselves to the highly customized world of dental labs that create dental implants for people. Under traditional circumstances, the process of taking an impression of a tooth, casting the impression, and sending it to a lab to be worked through the process into an implant may take weeks. Leveraging 3D printing and scanning, a scan of a patient's teeth may be taken, sent electronically to a lab to have an implant quickly designed and fabricated, and sent back to a dentist or oral surgeon for implantation. Considering the change in workflow and production pipeline, the dental lab will have to innovate to remain competitive. The initial cost of investment for a dental laboratory today would typically be $200,000, which is over 10 times more than the cost in 1990. The economic factors involved with the increased costs of investment and operation contribute to an ongoing contraction and consolidation of the industry in the last two years. The technological advancements in fields like CAD/CAM and additive manufacturing are not just driving the transformation of dental laboratories by themselves. Dentists and oral surgeons are also taking up these technologies in their local practices and will naturally pull the dental laboratory towards implementing these technologies into their operations by purchasing the equipment and changing their operations to support new demands in quality and speed. There are several 3D printing and manufacturing players with a host of different scales for dental practices that wish to fabricate parts using 3D printing and scanning, as well as choices in driving software for 3D scanning, design, and prototyping. CAD/CAM software packages need to be unique in employing models and techniques within dentistry. Generating planes, curves, and implementing mechanical motion and limitations must be understood to create and place teeth or dental appliances inside a jaw. These 3D printers can accurately print surgical guides, veneer try-ins, crown & bridge models, models for clear aligners, implant models and a wide range of various orthodontic appliances using 3D data directly from intraoral scans and CAD designs. Depending upon the needs of the laboratory for services offered, StrataSys 3D printers have the capabilities to jet multiple materials from one printer, including medically approved transparent material for temporary in-mouth placement. Additionally, printing solutions from StrataSys bring triple-jetting technology to dental and orthodontics, for printing multiple materials at one time or implant models that mimic real gum-like textures for accurate evaluation. This impressive feature provides users the ability to create gum-like softness and color with complete control. Sirona Dental Systems sells complete dental imaging systems that can create 3D markups of a patient's jaw and teeth. Among these is SICAT Air - an imaging system that allows for imaging and analysis of the upper airway and planning of dental appliances as they will exist in the patient's jaw. It combines the patient's 3D x-ray and optical surface data to create digital workflows. 3M also has a digital scanner that creates a digital workflow for dentists and dental labs. The 3M True Definition Scanner quickly and easily captures a 3D replica of oral anatomy and saves it as an industry-standard STL file. This format allows easy portability to different platforms, including 3M's other products for dentists and dental labs. KaVo provides the ARCUSdigma, a 3D ultrasonic navigator for diagnosis and therapy. The measuring device fits onto the subject's lower jaw with a design that doesn't create complications with measurement or restrict motion of the jaw. The device then takes an ultrasonic survey of the jaw's movement for diagnosis via Functional Analysis and therapy. Nobel Biocare has its own digital scanning system, the NobelProcera dental CAD/CAM system. This system helps dental labs scan, design, and produce dental restoration products in a streamlined workflow. The device scans models and molds of different sizes and complexity to quickly digitize them for design. This machine reduces the time in designing and prototyping by avoiding remakes and redesigns. Planmeca and E4D technologies created a same-day dentistry solution with the PlanScan CAM/CAM restoration system. Requiring no impressions or powders, the PlanScan delivers easy, same day, and on-site scanning. PlanScan features CAD/CAM design and milling of a restoration like a crown, inlay, onlay, bridges, and veneers. A general dental practice could use this tool to easily expand its services with only the investment and small training that this piece of equipment requires. B&D Dental Corporation is the maker of ORIGIN, a line of dental scanners, CAD/CAM systems, and milling machines. ORIGIN machines provide a range of digital workflow functions that provide savings in costs and time. B&D's ORIGIN Dental Scanner, milling machine, and duoTron sintering machine can work with different materials to create dental restorations. 3Shape makes 3D scanning and CAD/CAM systems. Some of its scanners, such as the TRIOS 3 inter-oral scanner, are handheld and integrate with software to produce scans and designs for milling centers. Others, like the D2000, are larger, which allows for highly accurate, fast, and colorized scanning of lab models. 3Shape's CAD/CAM systems can provide indications across several types of dental appliances. 3Shape's products are designed to be expandable, future-proof, and with strong levels of integration and support for a wide ecosystem of 3D printers and dental systems. The ongoing disruption of the dental industry is closely linked with that of manufacturers in healthcare and medical devices. In order to meet the new demands of speed and quality, research and development processes will be required to create innovative, improved technologies and processes to succeed. These research and development activities may qualify for federal and state R&D tax credits.